A little while ago, my friend Brad Merkel of Little Tree bows built me an Osage self bow with Static recurved limbs. He posted pictures on the pow wow forum. Recently I returned to Nebraska after having been weathered out two weeks prior. This time the weather cooperated and the birds were active. This past Friday found me sitting in my double bull in an area I call "the gauntlet"
It is a natural funnel created where three different ridges or benches come together. Added to the natural landscape is an ATV trail which the birds and deer and other critters like to use when traveling to and fro. What really cool is that when you set up your decoys on the ATV trail any birds crossing a bluff to my west and a nother to the east can see the decoy set up. I like to use a jake with a real tail and a feeding hen. We hadn't been there 1 hour, when the first big tom came running in. He came in so hard my counter part didnt have time to turn on the video camera and was unable to catch on film what looked to be a perfect shot. The cedar arrow with a big magnus head screamed thru the bird and we gave each other high fives in the blind. Unfortunately we celebrated too early as the bird ran out of sight and some how made it far enough down into the cedar choked canyon and was not recovered. I was sick and after several hours of searching gave up looking. 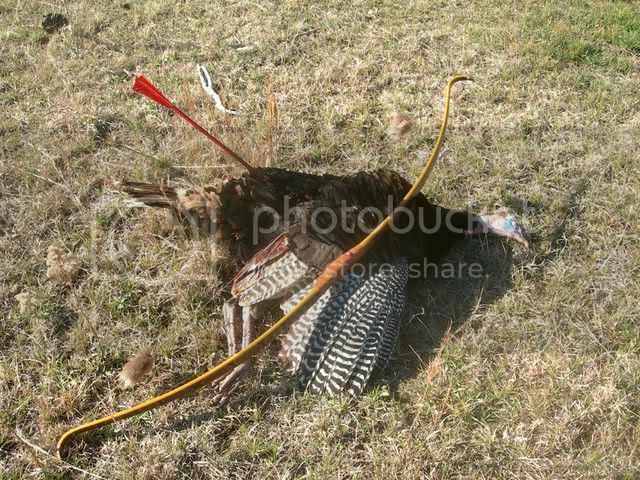 Turkey hunting with bows and arrows has its ups and downs and this was a real down. This was the bows maiden hunt and as it had not yet been named , I decided to call the bow " bad omen ". I conducted a silent debate all night and all the next day as I sat and thought about the ethics of bow hunting. I've been bowhunting with traditional gear since 1985 and loosing an animal never gets any easier to handle. But after much thought I returned to the task at hand knowing I did my best to recover that tom. Sunday morning the birds were gobbling to no end but the ridge where I sat produced no sightings at all. After two hours of listening to birds on and off, I got in the truck and drove the 1/2 mile back to the area near the guantlet. I snuck down the trail and was 50 feet from my blind when I saw a black form running off. Shoot, should have come here first, I said to no one in particular. I quickly set up the decoys and climbed in the double bull. Today I will hunt with a WW and perhaps the the 3 blade will make a difference I thought. It was 9:15 am and I heard a faint yelp in the Canyon to the south ( behind me). I yelped back and the hen answered, this time louder and closer. 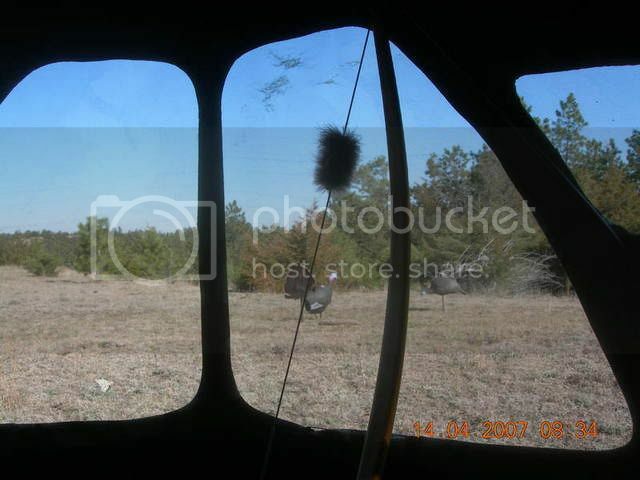 I peaked out the back window and could see two hens running hard thru the conifers being chased by a fair sized tom. Then hens ran into my set up with the tom dragging his wings and drumming. He spotted the fake jake and went into attack mode. I tried to pick a spot on him but he was moving way too fast. He pivoted, and head faked and went the back side of the decoy. The hens darted the oppisite way and were suddenly infront of him blocking my shot. They ran off pulling him with and no shot was taken. I sat for a minute and thought about what just happened. I looked at my set up and decided that if I moved the blind about 12 feet to my left , I would have a better shot angle if that same situation reocurred. Would lightning strike twice , in this story three times? I was slightly dozing off just a little while later, when a loud gobble exploded in my ear. I looked to my left and this tom was trotting in and gobbling hard. At 15 yards I could see he had no visable beard but I didn't think he was a jake. I was too focused on getting a shot. He came straight to his nemisis and circled around to the back side. At first I thought he was going mount the decoy, then he came around the front and began to display. I decided to wait until he was slightly quartering to me since my last broad side shot apparently was too far forward. i picked a spot and let go. I still can't figure out how but I missed the 7 yard shot.!! The bird spun but had no idea what had just happened as the Osage bow is super quiet. I grabbed my back up arrow and waited until I had another quartering shot. This time his back side was slightly turned towards me. I picked a spot and my arrow was there. He took 5 or 6 one legged hops and fell over. As it turned out my back up arrow was the same arrow from Friday's fiasco. I gave thanks to the bird for passing thru my circle of life and my circle of death. Thanks one more time to Brad Merkel. I won't soon forget this kill. That is a special one for sure Jim, way to go. Nice looking bow there too. real nice bird oh yeah that bow looks just like my one they are awesome bows. 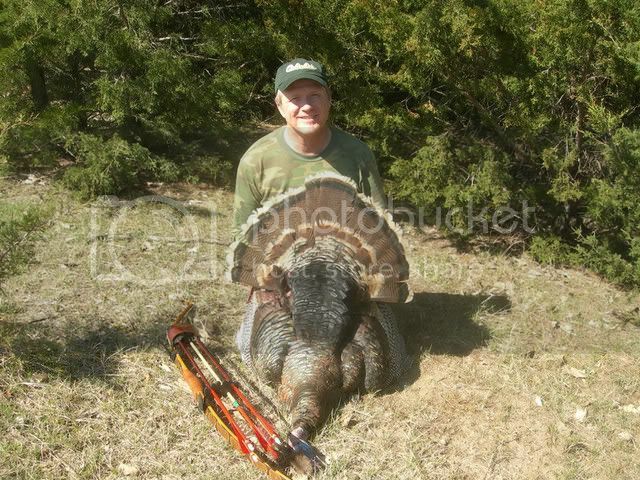 Way to hang in there and get your gobbler, well done! how did you guys do in Nebraska? enjoyed the story, congrats on your bird. Wow! Great story and pics...thanks.